The devious Du Noï wants to find the Athanor’s secret and it’s up to you to stop him! 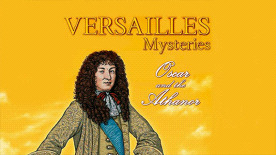 Alchemy, cunning spies and foul treacheries will enthral you through many hours of surprising twists and turns in the court of reigning King Louis XIV. Live the life of a 17th century gentleman using humour, logic and shrewd judgement to avoid the deadly traps of the Sun King's court in an adventure set across 25 historically accurate locations. Meet more than 30 characters, some fun, others deadly, including Totiri the Huron, The Marquess of Armantas, Batistini the painter and Master Theodore the great alchemist. Mini-games will teach you essential skills: learn to dance the Menuet in an historical interpretation of popular interactive dancing games, train to use a dagger and grappinou by proving your courage in a fight, and discover how to decipher fiendish enigmas.